My dear (we never say old) friend told me to join the Metropolitan Museum of Art (MET) for my New York month long experience. She said that the cost is $80 and a bargain, as it provides entrance for member and guest at each visit, with no lines for admission, at the MET, the MET Breuer, and the MET Cloisters. When you visit once, it is $25 general admission, and there is a long line always for entrance, sometimes an hour long, and you can avoid the lines. You will want to return again and again, especially due to tours and exhibits. She was right. The Anna Wintour Exhibit alone is worth a few visits. As an alternative, a senior ticket is $17 per person. For New York State residents as well as New York, New Jersey, and Connecticut students, the amount you pay is up to you. Admission tickets include exhibitions and are valid for three consecutive days at The Met Fifth Avenue, The Met Breuer, and The Met Cloisters. You can buy your tickets on line and then redeem your reservation for tickets as kiosks once you enter. If you are a member, there is a member’s desk to redeem your tickets with no line to wait on. The Metropolitan Museum of Art of New York is the largest art museum in the United States. According to Tripadvisor, the MET is New York City’s most visited museum and attraction, where you will experience over 5,000 years of art from around the world. The MET is the third most visited museum in the world, and according to Wikipedia, and maintains extensive original African, Asian, Oceanian, Byzantine, and Islamic art, collections of musical instruments, costumes, and accessories, as well as antique weapons and armor from around the world. The MET Breuer is small and on Madison Avenue and 75th Street and contains modern art, and has a wonderful exhibit right now on bodies in art and sculpture. The MET Cloisters is smaller too and in Upper Manhattan. Facades and entire actual buildings, ranging from first-century Rome through modern American design, are installed in the MET galleries. Yes, the MET contains buildings within buildings, and galleries within galleries. It can be a daunting task to navigate the MET, so plan on several visits with different intentions. The exhibit, ‘Heavenly Bodies, Fashion and the Catholic Imagination,” is at the MET until October 8, 2018, and it alone is a reason to go to New York City NOW. KNOW THE EXHIBIT IS IN TWO PARTS IN TWO LOCATIONS IN THE MET. GO FIRST TO THE LOWER LEVEL (BASEMENT) THROUGH THE EGYPTIAN HALLS AND DOWN THE STAIRS to see the diamond and gem incrusted crowns and jewelry, gold and silver hand stitched papal robes and accessories from the Sistine Chapel sacristy, many of which have never been seen outside The Vatican. THEN GO TO THE MAIN FLOOR TO THE MEDIEVAL GALLERIES for the Anna Wintour Costume Center. Be aware that when you enter the MET and ask how to navigate the exhibit, you will be directed to the Medieval Galleries first. Do not go there first. Not only will you avoid some of the crowds, you will see the original inspirations before you see the modern interpretations. Go to the MET website PAGE for the exhibit which includes links to various sections of the exhibit. You will see that the Exhibit is on view at The Met Fifth Avenue in Galleries 300–306, 955, and 980–981. Take a look at the map, as when you arrive inside the MET Great Hall, it is huge and crowded. Follow bottom right through Egypt to where the staircase to the lower level is. Go back to the Great Hall and follow up to where the Medieval Art is located in an enormous space. If you are inclined you can click on links to see photographs. This is the order you should actually see the exhibit, so you can be sure not to miss the treasures, which may not be easy to find when you are in the crowded exhibit. Take your time and read the anecdotes about each. Notice the jewels, the jewelry, the magnificence. Then, walk straight out around to see the vestments and capes. That is from the photographs, “Select Images: Objects from The Vatican Collection.” Notice the dates of each cape. Notice the Nuns that worked on the tiny Nativity scenes with gold and silver threads. HEAD UP THE STAIRCASE back through the Egyptian galleries. Okay, if you cannot help it, explore the actual Egyptian temple reconstructed in the center as you come up the stairs, and examine the Sphinx. The real Sphinx is worn and small, and this Sphinx is in fabulous condition and better than the real Sphinx. Everyone who has gone to Egypt and seen the Sphinx in Cairo is disappointed with it. Savor the MET Sphinx. HEAD BACK TO THE GREAT HALL and the center to the MEDIEVAL HALLS. Since you looked at the map, you know the poles with the dresses on them are on the way to the main gigantic and spectacular hall with the main attractions of the designer dresses. Wall past the dresses on poles to return later and head to the main hall to look for the Medieval Madonna statue clothed in beautiful clothing. This is the inspiration statue as royalty paid to dress the Madonna statue in medieval times. Then relish the modern designer versions of the wedding gowns. My favorite is the white with wings in the far right. Notice the designer interpretation of the nun’s habit and priest’s robe in the main gallery. Look up to the entrance to other galleries, as dresses and gowns may be above you. There are many small galleries off the main gallery, also not to be missed, with jackets and more. Mixed among the Medieval headdresses in one small gallery are modern headdresses. Look for the black label anecdotes rather than the beige ones for what is part of the Exhibit. Now, as you walk along the magnificent modern interpretations of gowns on poles on the way in and out of the Medieval Gallery, look to your left and right for other small galleries with more Exhibit treasures. YES, SAVOR THIS EXHIBIT AND TAKE YOUR TIME. You will not have time on this visit to see the MET. You have seen a MET treasure exhibit, had glimpses of other Galleries and know you want to return to the MET. When you plan to return to the MET, plan to take an hour HIGHLIGHTS tour. It is free with admission. Each docent is different and has a different focus, so you can return to do numerous highlights tours. The groups are small, and additional docents break off into small groups. It is a wonderful introduction to the museum, but it is also wonderful to return and take additional highlights tours or other tours offered as your outline of the visit. I found that some of our group booked tours back to back. I would not recommend to do that, as the docents go over the hour and you will miss so much by not finishing the tour with the docent’s conclusion of the theme. Our tour was on “Swagger” in art, and we went from European to Japanese to American galleries, passing musical instruments and armor and being shown the building facades inside the MET. The hour flies by and gives you reason to concentrate on an area you find interesting for this visit. Search EVENTS link for all the different events, at least three each day. Search TOURS link for the various daily tours. Search ALL ONGOING PROGRAMS link for what you might want to take advantage of. Check this link for future exhibits. 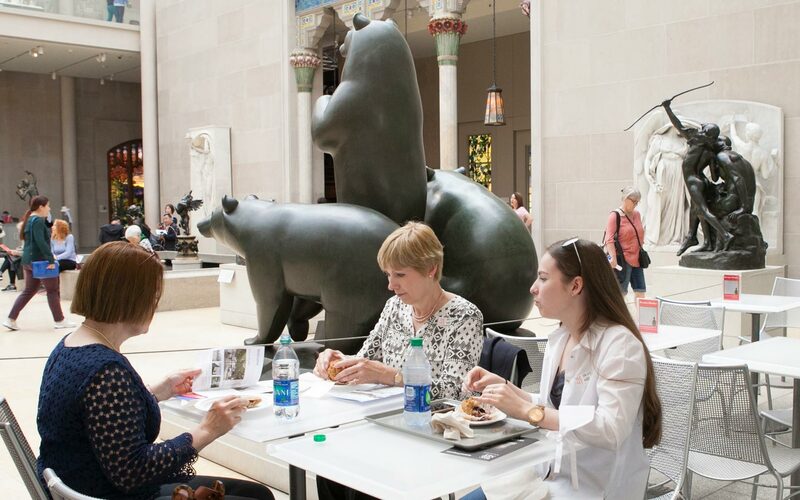 And, know that the Great Hall Café at the MET has great soup, salads, and light snacks surrounded by the beautiful MET indoor facades. Next, plan to walk along Central Park around the MET for the beautiful outdoors after the beautiful indoors. You will return to the MET and be wowed each time by what is offered to you in the largest art museum in the United States. Having a month in New York enables you to savor this treasure of New York City.